Completing the alphabetic presentation of the Storytellers for Peace, here is Suzanne Sandow, from Australia. Suzanne is director, actor, storyteller and workshop facilitator. She has studied acting at Nida and taught after-school drama from 1990 to 2001 at Melbourne Girls Grammar School. Suzanne took a side step from Acting and started storytelling well over 20 years ago at a Fairy exhibition for the Glen Eira City Council, she went with this exhibition to Kyabrum where she also presented Storytelling workshops for beginning tellers. Then she moved on to be a regular storyteller at Wonderwings Fairy Shop for adult parties. She has worked extensively as a teller in Schools, Libraries, Shops and Shopping Centers, Community Festivals and Private Parties. 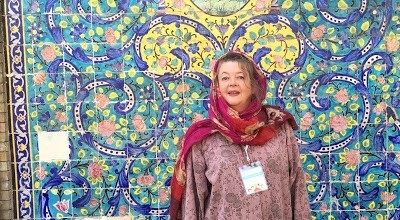 Suzanne often morphs into her Fairy Character - Moth for storytelling sessions as she recently did at the 18th Annual Kanoon Storytelling Festival in Iran. Suzanne has also had the honour of being the President of the Victorian Branch of Storytelling Australia and has served on the Committee for the last two years.